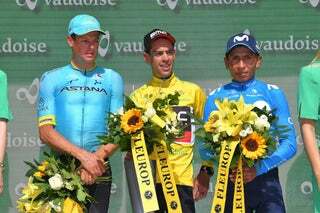 SAINT FELICIEN, France (AFP) — Daniel Moreno (Katusha) won the second stage of the Critérium du Dauphiné on Tuesday as Bradley Wiggins (Sky) held onto the overall race lead. Moreno won an uphill sprint for the line ahead of French pair Julien Simon (Saur-Sojasun) and Tony Gallopin (RadioShack-Nissan) after 160km of racing through the eastern Ardennes. Wiggins finished ninth, with the same time as second overall Cadel Evans (BMC Racing), who crossed in seventh, with the British rider leading the Australian in the overall standings by just one second. In an interesting turn, Wiggins, Sky teammates Edvald Boasson Hagen and Michael Rogers, and BMC Racing’s Philippe Gilbert went on the attack early, countering a move inside the first 20km of the stage. The peloton pulled the group back, but Sky laid its cards out, proclaiming that the team would not go on the defensive with Wiggins in the jersey. “We knew that the course was complicated at the beginning and our aim was to make the race difficult from the start,” said Wiggins. “Once again, the team did a fantastic job all day and, for me, it was much easier. Simon said that Moreno timed the winning attack perfectly. “I was perhaps a bit far off when it came to the sprint and I couldn’t rein in Moreno, who had anticipated things well,” he said. Wednesday’s third stage covers 167km from Givors to La Clayette. Editor’s Note: Keep your browser pointed to VeloNews.com for more from stage 2 of the Critérium du Dauphiné.